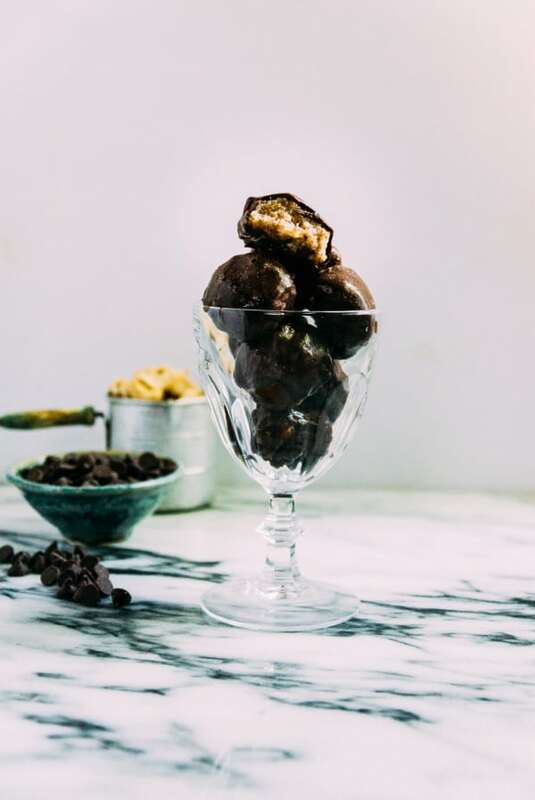 There is something about treats plucked straight from the freezer that says ‘it’s summer!’ and ‘I don’t remember how many truffles I ate!’, you know, since you’re eating them bit by bit throughout the day. I’ve had this coconut cashew truffles recipe rolling around in my head for a few weeks now, especially since I realized that the only candy/truffles recipes on the blog were a red wine version and a version made with lots of espresso. Regardless, I thought I needed to add the to no bake and truffle categories of the site this summer, so these easy coconut and nut filled truffles were born! 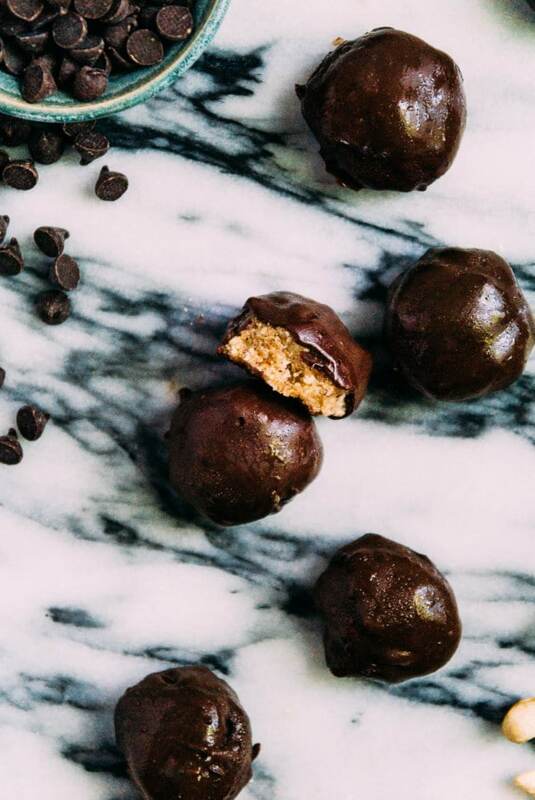 When I was trying out the filling for these truffles, I was figuring in my head that I could just blend together coconut and cashews and call it a day, right? Nope. Turns out that (go figure), if you blend cashews and coconut together on high, it makes coconut cashew butter, aka not a good filling/too runny for truffles. I may need to actually revisit that coconut cashew butter idea (noted), but for these purposes, I needed a filling that could be scooped out easily, but hold its shape when formed for the cashew truffle filling. Almond meal provided a perfect way to hold everything together, without making things too sticky or hard when they were frozen. Also, word to the wise, follow the proportions in the instructions to a T, or the truffles won’t hold together or will become to dry, either way, you will be left truffle-less and that’s just not a good situation. 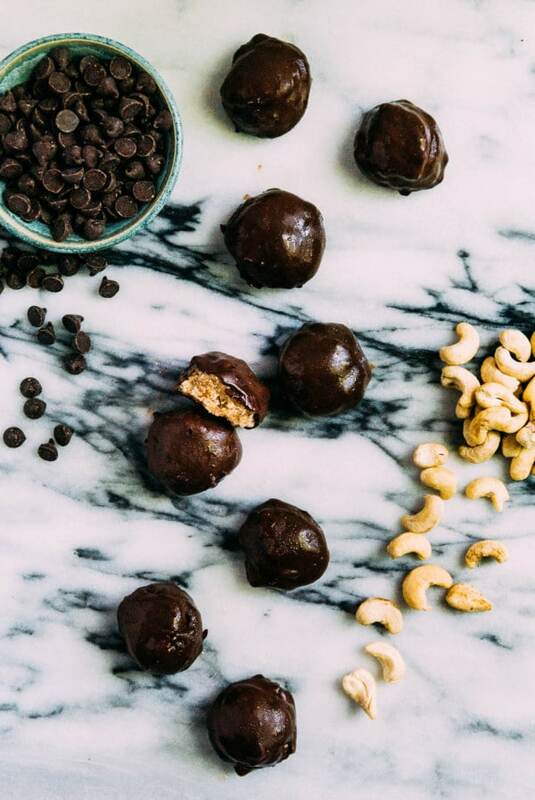 All around, these coconut cashew truffles are a perfect combination of no bake, filled with coconut, and covered in chocolate. If you aren’t a coconut lover like me, then these might not exactly be your thing. 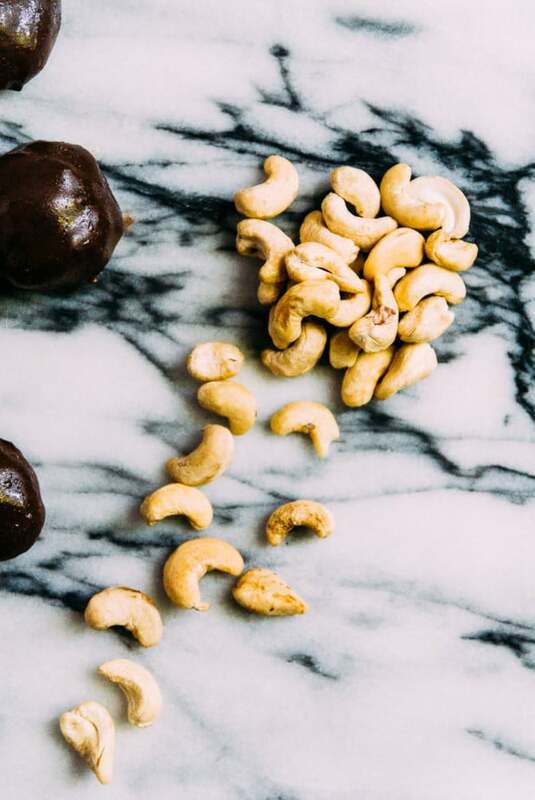 You can swap out the nuts for other varieties if you prefer, but I would recommend using something with a similar texture (cashews are a pretty soft nut) and ability to blend up into a filling. Happy official summer! I know the solstice was yesterday, but it feels crazy that June is already almost over. I have some fun weekends coming up soon, including a visit to Minneapolis this weekend to see a dear friend (and eat all the food) and birthday celebrations for my husband and myself next weekend. Stay tuned next week for a #popsicleweek recipe and a birthday cake that (cross your fingers) will hopefully be the best one yet. Also, if you have Minneapolis recommendations, please send them my way! 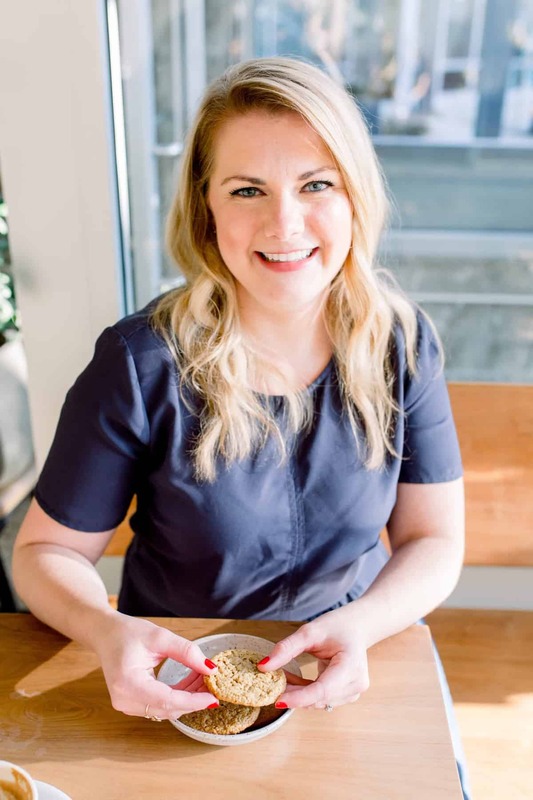 I think we already have a pretty extensive list going, but I’m always up for squeezing in another dinner or brunch along the way. Sweet and protein-packed coconut cashew truffles, made with almond meal, chocolate and just a little bit of salty! In a high powdered blender or food processor fitted with a blade attachment, blend together the coconut, vanilla, olive oil, raw cashews, and maple syrup. Blend until combined and most large chunks are processed. Add the almond meal and pulse until combined. Transfer the mixture to a bowl. 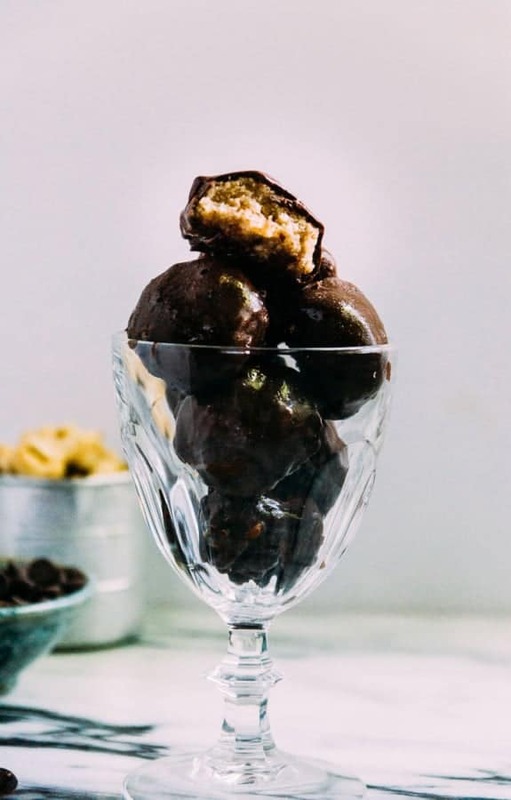 Lightly grease a cookie sheet and scoop out the truffle mixture with a cookie scoop or tablespoon and form into balls. Place on the cookie sheet. After all of the filling has been scooped out. Freeze the pre-formed balls until firm, at least 4-6 hours. 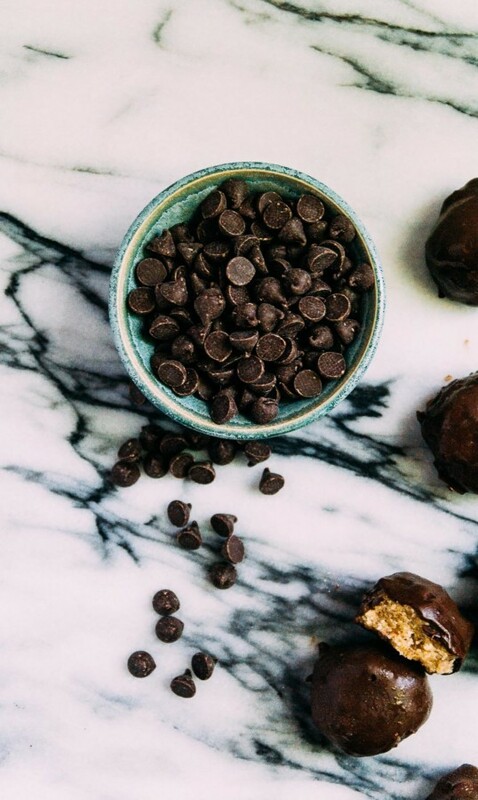 Once the truffles have been frozen, combine the chocolate chips and coconut oil together in a microwave safe bowl and microwave until almost melted, about 1-2 minutes. If you aren’t using a microwave, heat chocolate chips and coconut oil in a saucepan over low heat and stir until melted. After the chocolate has melted, dip each truffle into the chocolate and coat evenly on all sides, using a fork. Place each chocolate covered truffle on a cookie sheet. After all truffles have been dipped and placed on the cookie sheet, freeze for 4 hours or overnight until chocolate has set and frozen. Store truffles in the freezer for up to 2 weeks. Giiiiiirl! You’re SLAYING me with these truffles! I’m obsessed with all-things chocolate, and I could definitely see these treats becoming dinner on the nightly 😉 Beautiful!